Ion Exchange Whey (Milk) Protein Isolate, Microfiltered Whey (Milk) Protein Isolate, Evaporated Cane Juice Crystals, Natural Flavors, Potassium Chloride, Dicalcium Phosphate, Calcium Citrate, Magnesium Oxide, Acerola, Luo Han Guo, Citric Acid, Alfalfa, Alfalfa Concentrate, Garlic Powder Enriched with Selenium, Sodium Chloride, Zinc Sulfate Monohydrate, Dried Kelp Powder, Inositol, D Alpha Tocopherol Succinate, Beta Carotene, D-Calcium Pantothenate, Menaquinone (Vitamin K2), Copper Oxide, Pyridoxine, Riboflavin, Thiamine Hydrochloride, Cyanocobalamine, Soy Lecithin. Ion Exchange Whey (Milk) Protein Isolate, Microfiltered Whey (Milk) Protein Isolate, Evaporated Cane Juice Crystals, Cocoa Powder, Potassium Chloride, Natural Flavors, Dicalcium Phosphate, Calcium Citrate, Magnesium Oxide, Acerola, Luo Han Guo, Citric Acid, Alfalfa Concentrate, Garlic Powder Enriched with Selenium, Sodium Chloride, Zinc Sulfate Monohydrate, Dried Kelp Powder, Inositol, D Alpha Tocopherol Succinate, Beta Carotene, D-Calcium Pantothenate, Menaquinone (Vitamin K2), Copper Oxide, Pyridoxine, Riboflavin, Thiamine Hydrochloride, Cyanocobalamin, Soy Lecithin. This product is produced in a facility with soy, dairy, egg and wheat ingredients, peanuts and tree nuts. Ion exchange whey (milk) protein isolate, microfiltered whey (milk) protein isolate, evaporated cane juice crystals, cocoa powder, potassium chloride, natural flavors, dicalcium phosphate, calcium citrate, magnesium oxide, acerola, Luo Han Guo, citric acid, alfalfa concentrate, garlic powder enriched with selenium, sodium chloride, zinc sulphate monohydrate, dried kelp powder, inositol, D alpha tocopherol succinate, beta carotene, D-calcium pantothenate, menaquinone (vitamin K2), copper oxide, pyridoxine, riboflavin, thiamine hydrochloride, cyanocobalamine, soy lecithin. For a rich, thick shake, mix 2 scoopfuls (66g) with 12 fluid ounces of water in a shaker or blender. 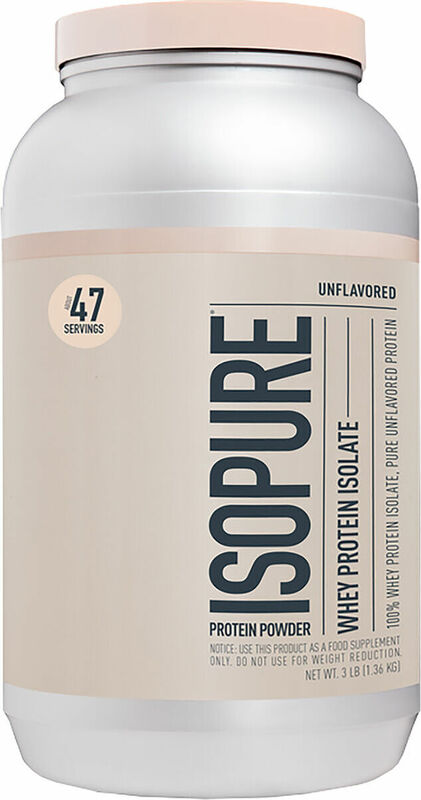 If a shaker or a blender is not convenient, NATURAL ISOPURE can be stirred into solution with a spoon. Drink one serving daily. Accidental overdose of iron containing products is a leading cause of fatal poisoning in children under 6. Keep this product out of reach of children. In case of accidental overdose, call a physician or poison control center immediately. 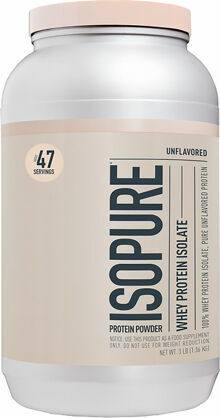 Nature's Best Natural Isopure contains 50 grams of 100% Whey Protein Isolate. Any and all impurities typically found in most whey proteins have been removed to provide you with a great tasting, lactose free, glutamine enriched, state of the art low carbohydrate protein supplement. Natural Isopure is sweetened naturally with cane sugar and Luo Han Guo and has no artificial colors, flavors, preservatives or sweeteners. Natural Isopure also uses only all natural vitamins and minerals. Nature's Best set out to create a product that didn't hide anything from its customers. We wanted you to know that our protein source is clearly identified as 100% pure whey protein isolate. Additionally, Perfect Natural Isopure is instantized so it can be taken anywhere and mixed with a spoon.